The 98th anniversary celebrations of the Late Ven. Hikkaduwe Sri Sumangala Nayaka Thera will commence today (29) at the Vidyodaya Pirivena in Colombo. He is considered to be one of the pioneers in the revival of Buddhism and the tradition of oriental education during the 19th Century in Sri Lanka. The greatest contribution of this prelate to the world of oriental studies is the foundation of Vidyodaya Pirivena in 1873 which was granted the university status late in 1959 by the Government of Sri Lanka. Today we find many academics, administrators, social and religious workers among the past pupils of this Pirivena and University who acquired both national and international reputation. Thus it becomes fitting and proper for us to celebrate the death anniversary of this eminent scholar and religious leader. 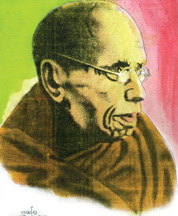 Sri Sumangala was born in Hikkaduwa during the year of 1827 to a well-off Buddhist family. When this child completed the fourth year of age his parents were compelled to take him to the head teacher of the Christian church and baptize him according to the custom existed at the time under the British rulers. Every child during this period should be baptized irrespective of religion if he intends to study in a Government school. Thus he was registered in the church as ‘Nicholas’ which is the Christian name given to him. However he did not continue his primary education in a Government school conducted by the church. Instead the child acquired reading and writing ability of Sinhala under the directions of a Buddhist monk in his village temple. Although the parents of this child attempted to send him to a Government school they were prevented from doing so by an astrologer who read his horoscope and predicted the failure of this little one to lead a prosperous mundane life. According to the predictions of this soothsayer the future of this child will be unfortunate and miserable if he leads a lay life. Thus they decided reluctantly to offer him to the Buddhist monks to be ordained. He was ordained as a novice in the famous Totagamuve Rajamahavihara in 1840 and given the name Sumangala. Initially the novice Sumangala studied Pali, Buddhism, Sanskrit and Sinhala under his teacher Ven. Revata. He also learned English language and Arithmetic from a lay teacher. After obtaining a comprehensive knowledge in these subjects he came to Ratmalana Paramadhammacetiya Pirivena to pursue his higher studies under the tutorship of Ven. Valane Sri Siddhartha, the eminent oriental scholar at the time. Thus he had an opportunity to study Buddhism and oriental languages thoroughly. The novice Sumangala, being a studious and intelligent student, mastered the entire ‘Tripitaka’ with its commentaries before he completed his 20th year of age. He acquired the comprehending, speaking, reading and writing skills in Pali and gained an advanced knowledge of Sanskrit and English. His rare ability to quote various passages and stanzas from Pali Tripitaka was marvellous and it created a great respect within the community of Sangha and Buddhist lay society. The scholarship during this period was based on the reading. Ven. Sumangala’s fluency in Pali is associated with the higher ordination ceremony (Upasampadaa) of young Sumangala at the Malvatu Maha Vihara in Kandy. For this historic occasion he presented a verse composition in Pali already prepared by him to the monks of the Malvatu Vihara Chapter. The monks raised doubts regarding his authorship of these poems and requested him to prepare an instant verse composition on a given topic, namely ‘the Mahanayaka of the Malvatu Chapter’. Within a very short period of time the novice Sumangala composed a number of stanzas on this topic and read them. Monks were amazed and appreciated his poetic skill and proficiency in the Pali Language. Gradually Ven. Sumangala gained a thorough knowledge in pali, Sanskrit and Buddhism. He was considered to be the most distinguished oriental scholar among the Buddhist monks and lay people. He was invited to become the head of the Paramadhammacetiya Pirivena in Ratmalana after the demise of his academic tutor Ven. Walane Sri Siddhartha. Later he came to Maligakanda in Colombo and founded Vidyodaya Pirivena, under the sponsorship of Vidyartha Sabha. It became as the famous institution of learning in Sri Lanka and other foreign countries. National as well as international students learned at this institution under the directions of Ven. Sumangala. He had a remarkable memory. As his biography points out Ven. Sumangala could quote any passage from Pali texts and commentaries without referring to books or notes whenever he wants to clarify doctrinal matters to the audience. Ven. Sumangala participated as the chief monk in the Dhamma Council held in Pelmadulla, Sri Lanka in 1867. The erudite monks who assembled there under his directions perused the entire Tripitaka carefully in comparing with different Pali manuscripts and recorded all texts on palm leaves with revisions wherever necessary. He assisted the Elder Migettuwatte Gunananda by providing Buddhist doctrinal details to be forwarded in religious debates that took place between Buddhist and Christians. He became a regular writer to the contemporary newspapers and periodicals such as Lankaloka, Sarasavi Sandaresa and Silumina. Out of his publications the following texts are of worth mentioning. Sidatsangara Samaya Kavsekara Sannaya and Balavatara Tika. The Balavatara Tika is an excellent text that depics Ven. Sumangala’s deep knowledge in Pali language and grammar. There he discusses Pali grammar analytically and arrives at logical conclusions. A very good example will be his analysis on the grammatical category known as ‘person’. As he points out the ‘third person’ both in Pali and Sinhala languages comes first, and then the ‘second person’ finally ‘the first person’. But in European languages including English ‘the first person’ is used initially and the ‘third person’ finally, the position of the second person remains unchanged in all these languages. On the basis of this analysis we may conclude that Ven. Sumangala had a thorough knowledge of the grammatical structure not only of Pali and Sinhala but also of European languages. The biography of Ven. Sumangala includes an interesting incident which is helpful to understand his proficiency in the English language. This elder was travelling by train from Colombo to Kandy in a first class compartment during the British Colonial period in Sri Lanka. Two Englishmen who were the owners of tea estates happen to travel in the same compartment. They became angry as they saw this elderly monk who was chewing betel and began to talk in English by themselves. One of them suggested to kick the old man out of the train saying that he got into the first class compartment by mistake. The opinion of the other fellow was to hand over the old man to the railway authorities because he was travelling in the first class compartment with a third class ticket. They thought that the monk did not understand English. He was seated solemnly while reading a book and chewing betel. They decided to hand him over to the railway authorities when the train stopped at Polgahawela. Meanwhile the train reached the Polgahawela Station. At the same time a train going from Kandy to Colombo too reached this station. The first class compartment of the Colombo train stopped parallel to the first class compartment of other train. Sir Arthur Hamilton, then Governor of Sri Lanka, was returning to Colombo in a special compartment of this train. The Governor came to the first class compartment of the Kandy bound train as soon as he saw Ven. Sumangala and began to converse in English. After this friendly conversation which lasted for nearly ten minutes the Governor went his special compartment and the trains departed. The white men became ashamed of themselves and apologized to the prelate. Ven. Sumangala was considered to be accomplished with the qualities of Bodhisatva by Sri Lankan Buddhist. The aim of Bodhisatva is to develop perfections while living in the society with a view to attaining the enlightenment. In considering the great service rendered by Ven. Sumangala to propagate Buddhism and to uplift the Pirivena education he was appointed as the Nayaka Thera of Sri Pada. He extended his service irrespective of caste, religion or social status of the people. While keeping Vidyodaya as the centre for excellence on oriental learning he helped the community of monks irrespective of different sects to establish Pirivenas in different parts of the island. The pupils of Ven. Sumangala who were brought under his guidance and strict supervision continue to serve Sri Lanka, its people, education and Buddhism. Thus this great and pious prelate rendered a tremendous service until his demise that took place in 1911. In conclusion I would like to consider the ceremonial activities organized by the members of the Vidyodaya community for the 98th anniversary of the late Hikkaduve Sri Sumangala Nayaka Thera as the acts of gratitude, kindness and veneration. Further I hope that the past pupils of this great institution and the Sri Lankan Buddhists may try to find out the possibilities of reintroducing the Pirivena education system as established by Sri Sumangala and other eminent Buddhist monks of Sri Lanka. This endeavour will help to preserve the high quality of the Pirivena education in this island.